Aims: This study aims to compare clinical outcomes in patients of recurrent implantation failure (RIF), who had embryo transfer (ET) following a receptive (R) endometrial receptivity array (ERA) and a personalized embryo transfer (pET) after a nonreceptive (NR) ERA. Settings and Design: This was a retrospective observational study. Study Period: July 2013–September 2017. Subjects and Methods: Two hundred and forty-eight patients having unexplained RIF who underwent ERA test were included in the study. Clinical outcomes were compared between patients having a receptive (R) ERA and those having a NR ERA who underwent a pET-based on ERA. Statistical Analysis Used: Chi-square and t-test. Results: ERA predicted receptive (R) endometrium at P + 5 in 82.3% (204/248) patients and NR in 17.7% (44/248) patients. Average failed previous in vitro fertilization cycles were 3.67 ± 1.67 among receptive ERA patients and 4.09 ± 1.68 among NR ERA patients. Pregnancy rate (PR), clinical PR, implantation rate (IR), abortion rate (AR), ongoing pregnancy rate (OPR), and cumulative PR were comparable between patients having receptive ERA who had a routine Embryo Transfer (ET) and those with an NR ERA who underwent a pET. Conclusions: ERA is helpful in identifying the window of implantation (WOI) through genetic expressions of the endometrium to pinpoint embryo transfer timing. pET guided by ERA in patients of RIF with displaced WOI improves IRs and OPRs. RIF is defined as the failure of three or more IVF cycles in which one or two morphologically high-grade embryos are transferred. The causes of RIF include pathological alteration of endometrial cavity such as endometrial hyperplasia, synechia, submucous fibroids/polyps, and endometritis, which are found in 18%–27% of cases; hydrosalpinx; increased incidence of embryonic chromosomal abnormalities; and hereditary and acquired thrombophilias. Implantation of the embryo is not always achieved even after correcting the abovementioned causes of RIF. The temporal window of opportunity in which the endometrial epithelium becomes receptive to the blastocyst is defined as WOI. Histological, biochemical, and ultrasound markers of endometrial receptivity are subjective and lack accuracy and a predictive value. The endometrial receptivity array (ERA) consists of a customized array containing 238 genes expressed at the different stages of the endometrial cycle and is coupled to a computational predictor that is able to identify the receptivity status of an endometrial sample and diagnose the personalized WOI (pWOI) of a given patient. The accuracy of ERA is much higher compared to other methods – a sensitivity and specificity of 0.99758 and 0.8857, respectively, in predicting a receptive endometrium. The results are reproducible in the same patients 29–40 months after the first test. In normal IVF/ICSI (Intracytoplasmic sperm injection) cycles, embryos are transferred on the same day (day 2, 3, or 5) each time considering a fixed WOI in every patient. But when good quality embryos fail to implant repeatedly, endometrial receptivity should be checked as the chances of it being displaced are high in such patients. ERA requires endometrial biopsy from a woman during her natural cycle or hormone replacement therapy (HRT) cycle at a specific time. Natural cycle biopsy is taken on luteinizing hormone (LH) surge + day 7 (LH + 7) or after five full days of progesterone (P + 5) in HRT cycle. During WOI, the endometrium will display receptive pattern. A nonreceptive (NR) result could imply a displaced WOI. Therefore, a second biopsy may be needed to validate this displacement. For that, a specific day for the second biopsy will be suggested according to the result of the first biopsy. Determination of the WOI will improve the implantation in a subsequent cycle with a personalized embryo transfer (pET). Rarity of data published on pregnancy outcome after ERA/pET in Indian context inspired us to conduct this study to find out the role of ERA to improve IVF outcome in couples with RIF. We have also studied the results in women using their own oocytes and donor oocytes. In this study, our aim is to compare clinical outcomes in patients of RIF who had ET after a receptive ERA and pET after NR ERA. The present study is a retrospective observational study involving 248 RIF patients who have been advised ERA test. The study was carried out from July 2013 to September 2017 at a tertiary infertility clinic, in compliance with the ethical principles of Declaration of Helsinki (Brazil, 2013), International Council on Harmonization Good Clinical Practice Guidelines (E6, 1996), Ethical Guidelines for Biomedical Research on Human Participants, (ICMR 2006), and other regulatory requirements. Each recruited patient has given written and informed consent for ERA test. Women having three or more unsuccessful fresh and/or frozen embryo transfer cycles each with one or two morphologically high-grade embryos using self or donor oocytes, in which no cause for RIF was found after thorough infertility workup, were included. All cases with nonoperated hydrosalpinx, submucous polyps or fibroids, previous ET with high difficulty and/or bleeding without cervical hysteroscopy correction, and thin endometrium (<6 mm) after either controlled ovarian stimulation (COS) or HRT were excluded. For routine infertility workup and to rule out causes of RIF, all recruited patients underwent vaginal ultrasound for endometrium and antral follicular count, hysteroscopy when indicated, karyotyping of both partners, lupus anticoagulant and anticardiolipin antibodies IgG or IgM, antithrombin III, thyroid-stimulating hormone, prolactin, random blood sugar (glycated hemoglobin in suspected cases), and serum homocysteine. All patients undergoing ICSI with their own oocytes were between 21 and 40 years, and those undergoing ovum donation (OD) were between 21 and 50 years. Inclusion criteria for patients with self-oocytes were normal ovarian reserve (AFC (Antral Follicle Count) >10) with adequate response to COS. Inclusion criteria for OD patients were minimum endometrial thickness of 6.0 mm and trilaminar pattern after estrogen priming. Physician fitness for pregnancy was also taken for all patients above 40 years of age or having any medical conditions. In patients with self-oocytes, embryos were vitrified on day 3 or at the blastocyst stage and embryo transfer performed in a subsequent HRT cycle on the day designated as receptive by the ERA test. In donor oocyte cycles, embryos were transferred fresh or frozen in HRT cycle. All patients underwent ERA on the HRT protocol. Estradiol valerate was started from 2nd day of menstrual cycle in increasing dose from 4 mg to 8 mg/day on day 6. When endometrial lining was >7 mm, serum progesterone level was measured. If serum progesterone level was <0.5 ng/ml, vaginal micronized progesterone 400 mg twice a day was added. The first endometrial biopsy was collected from the uterine fundus with the use of Pipelle catheters after five full days of progesterone administration (120 h). After the biopsy, the endometrial tissue was transferred to a cryotube containing 1.5 mL RNA (Qiagen), vigorously shaken for a few seconds, and kept at 4°C or in ice for >4 h. The samples were then shipped at room temperature to Igenomix Delhi for ERA transcriptomic analysis. Similar method and protocol were used for sample labeling and microarray hybridization, which was mentioned in the previous studies. Endometrial gene expression profile was processed, and the status of peak endometrial receptivity was diagnosed by the ERA computational predictor. The ERA test result was given as Receptive (R) or NR. NR test result usually reported as prereceptive or postreceptive and a recommendation is also to be given for a putative pWOI. In some cases, to validate this pWOI, a second endometrial biopsy and ERA analysis was performed after the recommendation of the ERA classifier. The second endometrial biopsy should be performed with similar protocol and biopsy was taken on the recommended day. If the result is prereceptive, the biopsy is to be taken on the recommended day after the previous biopsy day; if the result is postreceptive, the biopsy is to be taken on the recommended day before the previous biopsy day. ERA is convenient and usually well tolerated by patients except temporary mild abdominal pain. There is a theoretically risk for infection while taking endometrial biopsy, but in clinics with best practices, it is seldom reported. In addition to the cost of first ERA test, the patient has to bear the cost of subsequent ERA test when the first test shows NR pattern along with the recommendation of second ERA test. The patient has to wait for her embryo transfer till the ERA results, which usually comes after 3 weeks of biopsy. The subsequent embryo transfer should be done in the similar protocol as used during receptive ERA cycle, which in fresh self-IVF cycles involves an extra cost of freezing and thawing of embryos. Based on the first ERA report, we have classified all recruited RIF patients into ERA receptive (R) and NR. If NR, then it is subclassified into prereceptive and postreceptive. We assessed the IVF outcomes and compared parameters between patients who underwent routine embryo transfer at P + 5 following a receptive ERA and a pET on a specific receptive day other than P + 5, after a NR ERA. Our primary outcome was ongoing pregnancy rate (OPR), and secondary outcomes were pregnancy rate (PR), implantation rate (IR), clinical PR (CPR), abortion rate (AR), and cumulative PR. PR was defined by total number of beta-human chorionic gonadotropin (hCG)-positive (value >10 IU/L) patients divided by the total number of patients who underwent embryo transfer. IR was calculated by dividing total number of gestational sac visualized in first scan after positive hCG result by the total number of embryos transferred. Clinical pregnancy was defined as one in which a positive pregnancy was accompanied later by ultrasonographic evidence of gestational sac. OPR was calculated by considering all viable intrauterine pregnancy progressing beyond 12 weeks of gestation. For quantitative continuous variable, Student's t-test was used, and for categorical variables, Chi-square test was used. Mean age and previous failed cycles were reported as mean ± standard deviation and rest all data were in percentage. Significance was set at P < 0.05. SPSS 16.0 (IBM Corporation, Chicago, IL, USA) was used to analyze the data. First ERA test report predicted receptive (R) endometrium in 82.3% (204/248) patients and NR in 17.7% (44/248) patients. The average age was similar between R and NR ERA patients (33.67 ± 5.12 vs. 34.11 ± 4.49, P = 0.59). Patients with NR ERA had more failed previous cycles as compared with R ERA patients but not statistically significant (4.09 ± 1.68 vs. 3.67 ± 1.67, P = 0.59) [Table 1] and [Table 2]. NR endometrial samples were classified by the ERA predictor as prereceptive (n = 27; 61.4%) or postreceptive (n = 17; 38.6%). In 21 cases, a second ERA was performed, to confirm the displacement of the WOI. In those with a prereceptive result, the second biopsy was recommended on P + 6 or P + 7 in HRT cycles, depending on the specific PCA profile of each sample. In those with a postreceptive result, a second test was recommended on P + 4 or P + 3 in HRT cycles. The results for these second biopsies were receptive in 11 [Table 2] and was prereceptive or postreceptive in ten; whereas in one required third ERA test after second ERA (P + 6) was NR and was R at P + 7. Clinical follow-up was possible in 210 patients: 175 patients with R ERA and 35 patients with NR ERA in whom at least one ET was performed during the study period. Cumulative PR was calculated after second ET, in those who failed after first ET [Table 2] and [Table 3]. 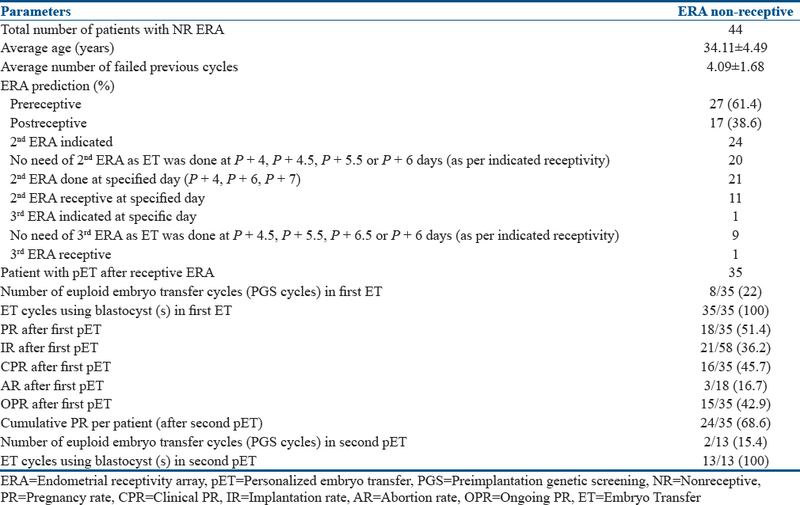 Out of 204 R ERA patients, 175 underwent embryo transfer where considering their receptive ERA status at P + 5, day 3 embryos were transferred after 3 days or day 5 embryos were transferred after 5 days of progesterone administration in HRT cycle resulting in PR of 56% and IR of 39% [Table 1]. Clinical follow-up was possible in 35 patients in whom pET was performed after NR ERA results; where it was considered that their pWOI was delayed to P + 5.5, P + 6, P + 6.5, or P + 7 or advanced to P + 4.5 or P + 4. Day 3 embryos were transferred with this strategy in HRT cycles after 2, 2.5, 3.5, 4, 4.5, or 5 days of progesterone administration, or day 5 blastocysts were transferred in HRT cycles after 4, 4.5, 5.5, 6, 6.5, or 7 days of progesterone administration, respectively, resulting in PR of 51.4% and IR of 36.2% [Table 2]. In first ET cycle of patients with R ERA versus NR ERA, the blastocyst (s) transfer (166/175 [95%] vs. 35/35 [100%]; P = 0.36) and euploid embryo(s) transfer (31/175 [17.7%] vs. 8/35 [22%]; P = 0.47) were similar, whereas it was also similar in second ET cycle with blastocyst (s) transfer (61/65 [93.9%] vs. 13/13 [100%]; P = 0.88) and euploid embryo(s) transfer (12/65 [18.5%] vs. 2/13 [15.4%]; P = 0.6), respectively. The proportion of RIF patients undergoing IVF using self versus donor oocytes was 59:41. The proportions of R-NR results in patients using self versus donor oocytes seemed to be similar (87:13 and 81:19, respectively). PR, CPR, IR, AR, OPR, and cumulative PR were comparable in patients of RIF undergoing embryo transfer following a receptive ERA and a pET after a NR ERA [Table 3]. Among NR ERA patients, PR (8/11 [72.7%] vs. 10/24 [41.7%]; P = 0.34), CPR (7/11 [63.6%] vs. 9/24 [37.5%]; P = 0.39), IR (11/16 [68.7%] vs. 13/42 [31.0%]; P = 0.1), OPR (7/11 [63.6%] vs. 8/24 [33.3%]; P = 0.3), and cumulative PR (10/11 [90.9%] vs. 14/24 [58.3%]; P = 0.41) were comparable in the patients using self versus donor oocytes [Supplementary Table 1]. The major cause of RIF of unknown origin lies in the transferred embryo graded by morphology or the good-looking endometrium, and both should be investigated thoroughly. Embryonic aneuploidy is likely to be the major contributor to human implantation failure, especially in cases of advanced maternal age. Chromosomal abnormalities occurring within the embryo have been shown to account for up to 60% of RIF. A prospective randomized controlled trial investigating the usefulness of preimplantation genetic screening (PGS) in RIF patients  demonstrated higher OPRs (47.9% vs. 27.9%; P = 0.0402) and IRs (36.6% vs. 22.1%; P = 0.0112) in the PGS group versus the unscreened blastocyst group. Thus, their study results indicated that embryonic defect might account for 20% of failed PR and 14% of unsuccessful IR. Transferring euploid embryo does not ensure 100% success rate in IVF as not all implantation failures are due to embryonic defects. Apart from healthy embryo, receptive endometrium also plays a major role in successful implantation. As NR endometrium (displaced WOI) is often found especially in the patients with RIF, personalized timing of embryo transfer at the time where endometrium was found to be receptive would improve implantation chances in RIF cases. Tan et al., 2018 conducted a study on the role of the ERA in patients who have failed euploid embryo transfers. They found that after pET, IR, and OPR were higher (73.7 vs. 54.2% and 63.2 vs. 41.7%, respectively) compared to patients without pET, although differences were not statistically significant. Thus, by transferring euploid embryos in a personal WOI, much better PRs are expected. Among NR ERA patients in our study, 31.4% (11/35) underwent ICSI using self oocytes and 68.6% (24/35) underwent ICSI using donor oocytes though the difference in the distribution is not statistically significant. Among these patients, ICSI outcomes were statistically similar in self-IVF cycles as compared with donor oocyte cycles [Supplementary Table 1]. In these RIF patients where WOI was displaced, after correction using pET, we were expecting better IVF outcomes in donor cycles as compared with self-IVF cycles as embryonic factors are usually eliminated with donor oocytes. In addition to that, the usage of blastocyst(s) and euploid embryo(s) were also similar in R ERA versus NR ERA patients with comparable IVF outcomes which signifies that the endometrial factor is an independent variable in RIF cases and should be dealt separately by ERA and pET. In our study, we found displaced WOI (~18% NR ERA) in one out of five RIF patients, which is comparable with other studies – 25.9% NR ERA in the study by Ruiz-Alonso et al., 27.5% NR ERA in the study by Mahajan, and 24% NR ERA in the study by Hashimoto et al. This NR endometrium was classified as pre- or post-receptive, which was further verified by a second ERA test (if recommended). We found that majority of NR ERA patients were prereceptive. Nearly, 61.4% (27/44) of NR ERA patients were prereceptive and 38.6% (17/44) were postreceptive which is comparable with the study by Hashimoto et al., 2017 where they found 66.7% patients were prereceptive and 25% were postreceptive. Ruiz-Alonso et al., 2013 also found 84% NR ERA patients were prereceptive and 16% were postreceptive. In this study, we observed that all IVF outcomes were comparable between the patients having a receptive ERA who underwent a routine ET versus those who had a NR ERA and underwent a pET (IR 39% vs. 36.2%, P = 0.78, OPR 41.7% vs. 42.9%, P = 0.93). Similar results were obtained by Ruiz-Alonso et al., who observed that IVF outcomes after pET in NR ERA cases (38.5% IR and 50% PR) were comparable to receptive ERA cases (33.9% IR and 51.7% PR). Thus, clinical implication of pET in these NR RIF patients was strengthened by our results where IR and PR increased to the level of receptive RIF patients. Even in patients with R ERA results, when embryos were transferred in a subsequent HRT cycle, clinical results (PR) in these RIF were similar to those in our general infertile couples. Improved IVF outcome in RIF cases after pET was well-documented in many retrospective studies,, but Simon et al. by their prospective randomized study has proved its role even in the women who is going for their first IVF cycle. He proved that after pET (based on ERA test results), PRs and OPRs (85.7% and 55.1%) were significantly higher as compared with fresh embryo transfer (61.7% and 43.3%) or deferred embryo transfer (60.8% and 44.6%) without ERA. Ruiz-Alonso et al. have compared RIF group (with 4.8 ± 2.0 previous failed cycles), with the control group (with 0.4 ± 0.5 previous failed cycles) and proved that RIF group has higher NR ERA test results compared with control group (25.9% vs. 12%), which suggests that RIF patients have higher chance of displaced WOI. They have also mentioned that in RIF group, NR ERA patients had more numbers of previous failed cycles as compared with R ERA patients (5.0 ± 1.8 vs. 4.8 ± 2.1), which suggests that more the number of previous failed cycles, more the chance of having displaced WOI. We also have similar results in our study, where the average number of previous failed cycles are more in NR ERA patients as compared with R ERA patients (4.09 ± 1.68 vs. 3.67 ± 1.67), though it is statistically nonsignificant (P = 0.13). Personalized medicine is a well-accepted concept in reproductive medicine, from the type and dose of gonadotropin in COS according to ovarian reserve and body mass index, and fertilization technique selection (ICSI, IVF, or both) based on sperm features and clinical background, to embryo development criteria according to the number and quality of embryos available. Interestingly, the endometrial status of all patients is treated equally at the time of ET, which is guided only by the embryo development stage and is supported by the administration of P/hCG in the luteal phase. Receptive ERA result suggests the possible peak receptive window of the endometrium for a good quality blastocyst to implant. Our study apart from being retrospective in nature has a limitation of having smaller sample size especially in NR ERA arm as compared with R ERA arm despite that our study is the largest study from India on ERA considering the overall sample size of 248 RIF patients. As majority of our RIF patients have done their past IVF treatments in other clinics/centers with poor documentation, we have limited information on the past treatment cycles, i.e., fresh or frozen cycles, cleavage stage, or blastocyst stage embryo transfer. Although our data demonstrated displaced WOI effects ~18% of RIF patients, in some cases, chromosomal abnormalities in the embryos combined might have contributed to RIF. RIF with displaced endometrial WOI is not pathology but our inability to diagnose and predict a right time window when the endometrium will be receptive. Not all patients with RIF have defective endometrium, but some of them have different timing for endometrial receptivity, and personalized timing for embryo transfer would be helpful in such patients. ERA has demonstrated higher chances of displaced WOI in RIF patients, and this finding is supported by the studies where a different endometrial gene expression profile have been demonstrated in RIF patients versus fertile control group., Thus, we have now one more factor to look for is the peak endometrial receptivity by ERA in the management of unexplained RIF. ERA test is accurate and sensitive in identifying genetic expressions of the endometrium to pinpoint embryo transfer timing. pET guided by ERA significantly improves PRs, IRs and OPRs in patients with unexplained RIF. Personalization of the endometrial factor by an objective diagnostic tool must be considered in the infertility workup. Simón C, Martín JC, Pellicer A. Paracrine regulators of implantation. Baillieres Best Pract Res Clin Obstet Gynaecol 2000;14:815-26. Mahajan N. Endometrial receptivity array: Clinical application. J Hum Reprod Sci 2015;8:121-9. Ruiz-Alonso M, Blesa D, Díaz-Gimeno P, Gómez E, Fernández-Sánchez M, Carranza F, et al. The endometrial receptivity array for diagnosis and personalized embryo transfer as a treatment for patients with repeated implantation failure. Fertil Steril 2013;100:818-24. Demirol A, Gurgan T. Effect of treatment of intrauterine pathologies with office hysteroscopy in patients with recurrent IVF failure. Reprod Biomed Online 2004;8:590-4. Meyer WR, Castelbaum AJ, Somkuti S, Sagoskin AW, Doyle M, Harris JE, et al. Hydrosalpinges adversely affect markers of endometrial receptivity. Hum Reprod 1997;12:1393-8. Pehlivan T, Rubio C, Rodrigo L, Romero J, Remohi J, Simón C, et al. Impact of preimplantation genetic diagnosis on IVF outcome in implantation failure patients. Reprod Biomed Online 2003;6:232-7. Penzias AS. Recurrent IVF failure: Other factors. Fertil Steril 2012;97:1033-8. Murray MJ, Meyer WR, Zaino RJ, Lessey BA, Novotny DB, Ireland K, et al. A critical analysis of the accuracy, reproducibility, and clinical utility of histologic endometrial dating in fertile women. Fertil Steril 2004;81:1333-43. Díaz-Gimeno P, Horcajadas JA, Martínez-Conejero JA, Esteban FJ, Alamá P, Pellicer A, et al. A genomic diagnostic tool for human endometrial receptivity based on the transcriptomic signature. Fertil Steril 2011;95:50-60, 60.e1-15. Garrido-Gómez T, Ruiz-Alonso M, Blesa D, Diaz-Gimeno P, Vilella F, Simón C. Profiling the gene signature of endometrial receptivity: Cinical results. FertilSteril2013;99:1078-85. Kung A, Munne S, Bankowski B, Coates A, Wells D. Validation of next-generation sequencing for comprehensive chromosome screening of embryos. Reprod Biomed Online 2015;31:760-769. Scott RT Jr., Upham KM, Forman EJ, Hong KH, Scott KL, Taylor D, et al. Blastocyst biopsy with comprehensive chromosome screening and fresh embryo transfer significantly increases in vitro fertilization implantation and delivery rates: A randomized controlled trial. Fertil Steril 2013;100:697-703. Rubio C, Bellver J, Rodrigo L, Bosch E, Mercader A, Vidal C, et al. Preimplantation genetic screening using fluorescence in situ hybridization in patients with repetitive implantation failure and advanced maternal age: Two randomized trials. Fertil Steril 2013;99:1400-7. Tan J, Kan A, Hitkari J, Taylor B, Tallon N, Warraich G, et al. The role of the endometrial receptivity array (ERA) in patients who have failed euploid embryo transfers. J Assist Reprod Genet 2018;35:683-92. Hashimoto T, Koizumi M, Doshida M, Toya M, Sagara E, Oka N, et al. Efficacy of the endometrial receptivity array for repeated implantation failure in Japan: A retrospective, two-centers study. Reprod Med Biol 2017;16:290-6. Simon C, Vladimirov I, Castillon Cortes G, Ortega I, Cabanillas S, Vidal C, et al. Prospective, randomized study of the endometrial receptivity analysis (ERA) test in the infertility work-up to guide personalized embryo transfer versus fresh transfer or deferred embryo transfer. Fertil Steril 2016;106:e46-7. Tapia A, Gangi LM, Zegers-Hochschild F, Balmaceda J, Pommer R, Trejo L, et al. Differences in the endometrial transcript profile during the receptive period between women who were refractory to implantation and those who achieved pregnancy. Hum Reprod 2008;23:340-51. Koler M, Achache H, Tsafrir A, Smith Y, Revel A, Reich R, et al. Disrupted gene pattern in patients with repeated in vitro fertilization (IVF) failure. Hum Reprod 2009;24:2541-8.